After A Long, Dry Spell Of The No-Horsepower Blues, Jim And Nancy Conners Finally Found High-Octane Fun Behind The Wheel Of Their '02 Mustang GT. For Jim Conners of Jacksonville, Florida, adulthood had largely been spent handling a family medical crisis, which obviously took priority over his fun time behind the wheels of his numerous hopped-up rides. Midlife came and went, and it wasn't until a few years ago that things had finally settled into a normal rhythm again. Jim, now 61, was feeling the urge to get behind the wheel and have some fun. After modifying his '89 F-150pickup and hitting the show scene a bit, he decided that the Ford Ranger he was driving wasn't cutting it as part of the family fleet. Jim and his wife, Nancy, went to their local Ford dealer, Duval Ford in Jacksonville, and drove away with this Mineral Gray '02 Mustang GT. "I wasn't sure Nancy liked the Mustang," he says, "but now I think she likes it more than I do." Well, it didn't look quite like it does now when they wheeled it off the lot, but it did perform admirably given its V-8 power. Jim, however, knew it could be better. 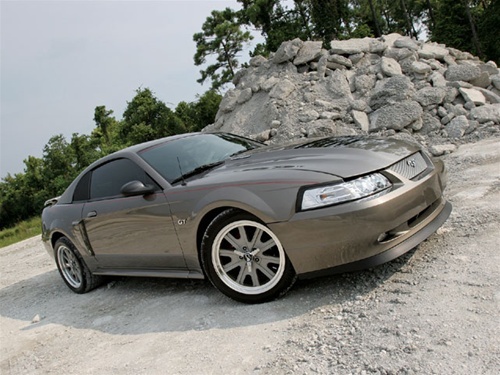 A cold-air kit and underdrive pulleys were the first modifications to the colt, followed by a complete Mac PerformanceProducts exhaust system from the headers to the tailpipes. The 20 or so horsepower that the Mustang picked up was decent, but still not what Jim was looking for. Let's face it, most enthusiasts want to be mashed into the seat when they hit the go pedal, and the meager mods, while fruitful, just didn't provide that heart-quickening thrill. As you might guess from the aftermarket hardware under the hood, this 4.6L motor makes more than double the factory output. That's when the Vortech supercharger showed up. The S-Trim centrifugal blower boosted the intake charge and the horsepower, but by this point, the modifying bug had bit, and Jim wasn't stopping any time soon. A Fox Lake Power Products P-51 intake manifold was next on the list for the Two-Valve powerplant, and while the car was now putting out some major horsepower, the tuning wasn't quite to Jim's liking. That's when he took the car to HP Performance in Orange Park, Florida. HP's Tony Gonyon gave the 4.6L GT a custom flash tune, and the car was running like new again. He also suggested Jim switch his 3.73 ring-and-pinion gears to a 4.10 setup, which Jim says woke up the supercharged steed quite a bit. The 4.10s worked better with the Mustang's 4R70W four-speed automatic transmission than the 3.73s, but with all of the power the horse was kicking out, the transmission itself needed some attention, so the HP crew installed an Art Carr unit with a 3,500-stall converter and B&M transcooler. A FordRacing Performance Parts aluminum driveshaft soon followed. While This Mustang may look like your average 13-second ride, it packs a 583-rwhp punch that delivers low-11-second elapsed times. With Jim now able to blaze the Nitto 305/35/18 555 rubber at will, it was time to tighten up the suspension components, which were only designed to handle the stock 260 hp. To that end, the HP Performance crew installed a UPR tubular K-member and control arms along with coilover shocks up front. Supporting the 4.10-geared, Moser axle'd 8.8 rearend is a quartet of Mac adjustable control arms, and Eibach springs and shocks. The chassis was stiffened with Steeda subframe connectors, and a UPR driveshaft loop was installed for safety. Vintage Shelby-styled wheels measure 18x9 inches up front and 18x10 out back. Subtle exterior mods, such as the aftermarket headlights, grille, and Steeda Q400 hood enhance the Mustang's look without going overboard. Jim was still looking for more power from the Two-Valve mill, however, so the S-Trim was swapped out for a Vortech T-Trim supercharger. Jim's not exactly light on the gas pedal as you might have guessed, and unfortunately the stock short-block couldn't keep up with its owner's demands. To solve that problem, Boss 330 Racing in Vero Beach, Florida, put together a hot 4.6 powerplant using the stock block as a foundation. The cast-iron hunk was decked and line-honed, and stuffed with a Cobra steel crankshaft, Eagle forged connecting rods, and CP forged-aluminum pistons. Fox Lake Two-Valve cylinder heads were chosen and further modified by Kris Starnes. Boss 330 Racing's Al Papitto installed a pair of Comp Cams camshafts atop the 9:1 compression engine. With the air now more than capable of moving through the engine in a timely fashion, Jim had the HP staff upgrade the fuel system, starting with an Aeromotive A1000 fuel pump and regulator. The 60-lb/hr fuel injectors and SCT 2800 mass airflow sensor tells them exactly how much fuel to flow. Though the Vortech Aftercooler is a great piece, HP Performancemade it better by installing one of its Quarter-Mile Coolers in the spare tirewell of Jim's Mustang. The reservoir holds nearly eight gallons of coolant-or ice water, depending on what you want to use-and keeps the inlet air temperature of the 19 psi of atmosphere in a very safe range. After some custom tuning of the EEC V engine-management unit, the Mineral Gray Mustang turned the Dynojet rollers to the tune of 583 rwhp and 469 lb-ft or torque. That's been more than enough to handle its share of Vipers and Hemi trucks, and get it thrown off the dragstrip. While Jim limits his full-throttle blasts to the street, HP's Gonyon has handled track driving and piloted the Pony to a best elapsed time of 11.1 seconds at 124 mph. After getting the boot a few times, Tony and Jim decided it was time to install a rollbar, especially if they intend to continue having fun with the car at the track. The Maximum Motorsports piece was quickly handled, and a set of lightweight slicks and skinny drag tires wait for the track call. Currently the goal is to get it into the 10s, but the Mustang still serves as frequent transportation and attends car shows regularly. "When you drive a Mustang, you feel like you're a teenager again," Jim says. "Nancy and I go on dates in the car, and it has won many trophies at shows." No longer on hiatus, Jim's thrills behind the wheel have seen this Mustang go from meek to maniacal. It will always be one of his favorites, but his new project-a supercharged 5.0 hatchback Fox-body-is sure to scratch that itch for him as well. Jim And Nancy have been hard at work modifying their Mustang, and the interior was no exception. Davis Seat Company in Arlington, Florida, whipped up the custom graphite-and-red leather seat covers, and if the exhaust note isn't enough, there are a pair of televisions, a pair of 12-inch subwoofers, and a high-powered sound system to keep things rocking.